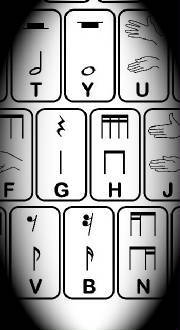 Exciting font tool for Orff and Kodaly teachers! hand sign materials for your classes, this is it! SingASign includes both diatonic and chromatic hand signs. Also included are quick-to-type stick rhythm notation groups. to make games & activity sheets. under the Home Key positions. You don't even have to move your hands! Rhythm entry is also quick and easy! Stick notation is grouped by beats, not just single notes. are typed with the index fingers! Two fingers-- how easy is that? Make your own great-looking visuals. Save your retirement money that you're now spending on teaching materials! To purchase SingASign, click HOW TO ORDER. There are many variations of chromatic hand signs. diatonic set, teachers have more or less developed their own. the most widely used and the easiest for children to make with their hand. should be typed right before the diatonic which is to be lowered.